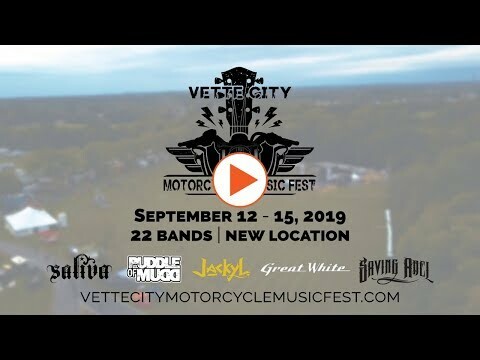 Vid Monster is excited to announce their video partnership with the Vette City Motorcycle Music Fest (VCMMF) for another year! We are the official Video Team for the VCMMF. The event is back for the 2nd year after a great first year! 2019's event features a new location, more vendors, the burnout contest is back again, 4 days with 22 bands, of course you should bring your motorcycles and golf carts to play on there (sorry, no ATV's), and the Video Wall is back! But let's talk about the bands... It's a great lineup happening over the 4 event days! Jackyl, Puddle of Mudd, Colt Ford, Great White, Saliva, Saving Able, Tantric, Trapt, Head East, Small Town Titans, Geneva, Louisiana Swamp Donky, Outlaws & Moonshine, Jasmine Cain, Kiss Kiss Bang, Jenn Ford, Gravel Switch Wolf Island Kosmonauts, Kyle Daniel,The Dustin Lee Benefield Band and Tailgate Revival. The location is now at Edge Hill Farm located at 13101 Louisville Rd., Oakland, KY.
​"The property has a storied history of hosting some of the most memorable music events in our area. The grounds are impeccable and the staff is so excited to be a part of the Vette City Motorcycle Music Fest and we're proud to call this home. We now have a venue that has unlimited potential for growth and most importantly memories. There is camping in the trees, a pond, a second stage, and a gradual amphitheater (no huge uphill climb) as well as a huge starry sky that will make you feel like you can reach up and grab one. Just 4 miles from the I-65, exit number 30, and just 9 miles north of Bowling Green. One of the most enticing and beautiful "rides' in our part of the world is the short 7.6 miles from Edge Hill Farms to Mammoth Cave National Park." This event is being put on by Bowling Green Daily News and D93 WDNS Radio Station. Contact information is on their website if you're interested in learning more or go to vettecitymotorcyclemusicfest.com for more event info. Vid Monster Productions is proud to announce our partnership with the Bowling Green Hot Rods for the 2019 season as their Replay Sponsor and Video Services Vendor. Vid Monster will have exclusive signage along both dugout perimeters facing the field, as well as, sponsoring all Replay's on the giant new video board at the stadium, covering the always-fun-never-boring Special Event Theme nights, and proving many fun top-secret video projects you'll just have to wait to see! The Bowling Green Hot Rods, Class-A affiliate of the Tampa Bay Rays and 2018 Midwest League Champions, will be upping their video game with Vid Monster this season with lots of fun videos, capturing the fun events, and sharing more original content overall. Additionally, there will be a new way to watch the game: MiLB TV. According to a recent Press Release by the Hot Rods regarding MiLB TV: "For the first time in franchise history fans will also be able to watch Hot Rods home games online with MiLB TV while anyone attending a game at Bowling Green Ballpark can view the new in-house game feed." Come join in on the fun with us! Bowling Green Hot Rods Opening Night is on Saturday April 6, 2019. For ticket packages, memberships, or clubs please visit www.bghotrods.com or call 270-901-2121. Maybe you'll see yourself on their videos after going to a game? Keep an eye out! If your company is considering outsourcing their Video Creative Services with Vid Monster Productions, just like the Hot Rods, please reach out and contact us or call 270-681-7810 to review your video needs. "Save the Depot" - March Poster Unveiling from Vid Monster Productions, LLC. on Vimeo. While we may dabble in the current and future technology space of video, we have a soft spot for the past and the vintage. We know that in order to get where we're going tomorrow, we need to learn about and appreciate the things from yesterday. Sam Kirby, CEO & Creative Director, and Jennifer Martin, Marketing Director, were present to perform the unveiling of this month's featured poster. The poster, which was a nod to Women for National Women's History Month, can be purchased on site or online at The Historic Railpark and Train Depot. All proceeds for the poster purchase go toward the depot’s “Save the Depot” campaign and are 11 in X 17 in. Our media friends at The Bowling Green Daily News were also there to celebrate the unveiling today too!